Valentine's crosspatch printable. 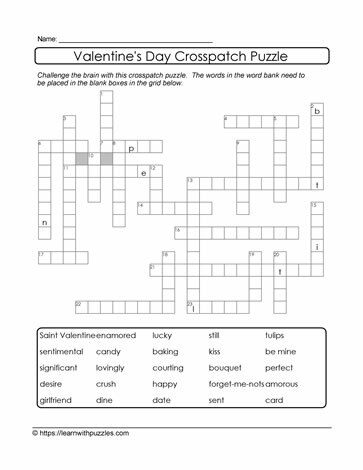 Here is a hint-enabled crosspatch puzzle for Valentine's Day. Engage students in elementary 3,4,5 grades classrooms with this brain teaser. Solvers complete the puzzle by filling-in-the-blanks with 25 words appearing below the framework. Some hints provided. Use in all learning environments: digital, Google, home schooling and regular classrooms. Activate problem solving and vocabulary building skills with this crosspatch printable.